This wooden cravat is carved in imitation of Venetian needlepoint lace and is life size. It was made to demonstrate the carver's skill. Similar cravats appear in architectural decorative schemes associated with Gibbons. This piece was probably made to show and impress potential patrons. The cravat belonged to Horace Walpole (1717-1797) who thought highly of Gibbons' work as a woodcarver. His family home, Houghton, Norfolk, included a room decorated with Gibbons' carving. Walpole thought that one of the ivory reliefs on his cabinet (W.52:1-1925) - that representing Judith with the head of Holofernes - was also carved by Gibbons although this attribution is not accepted today. Gibbons' cravat was displayed in the Tribune Room at Strawberry Hill with the Walpole Cabinet. It formed part of Horace Walpole's collection of special small objects. In 1769 Walpole wore the cravat to receive some distinguished French, Spanish and Portuguese visitors at his Twickenham home, Strawberry Hill. 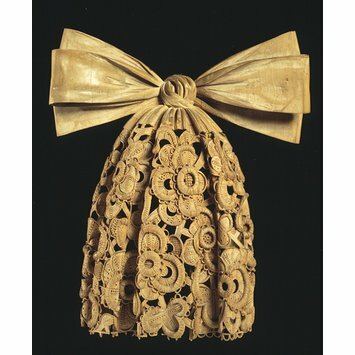 Cravat carved from limewood with raised and openwork carving, 24.1 x 20.9 x 5.1 cm. 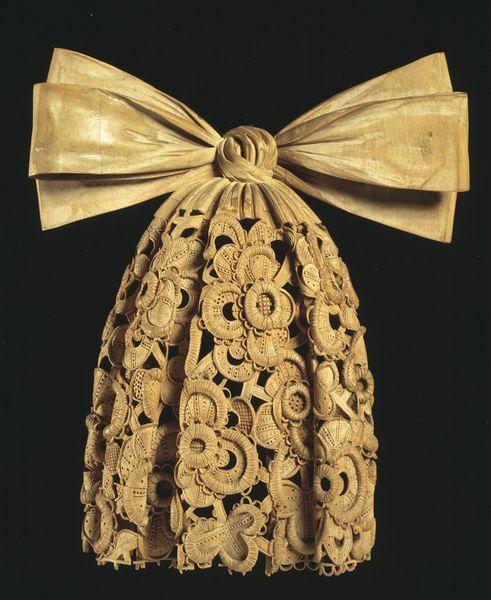 Carved in imitation of Venetian needle lace fashionable in the late seventeenth century and similar to those used in other schemes of carved decoration associated with Gibbons. The lace represented would be a piece measuring 32 x 16.5 cm if it were laid flat. In the Description of Strawberry Hill, 1774, the cravat was in the Tribune and was identified as by Gibbons. In the 1784 edition it is described as 'a present from Mr. Grosvenor Bedford', who had given the cravat to Walpole by 1769. Sold in the Strawberry Hill sale, 1842, day 15, lot 99, when it was bought by Miss Burdett Coutts for 9 guineas. Sold from the collection of the late Baroness Burdett-Coutts on 11 May 1922 by Christies (lot 345a). Bought by Read for £26.5. Given to the Victoria and Albert Museum in 1928 by the Hon. Mrs Walter Levy. Shown at Strawberry Hill for the exhibition 'Lost Treasures of Strawberry Hill: Masterpieces from Horace Walpole's Collection', 20 October 2018 - 24 February 2019. See below for reference to catalogue. Snodin, Michael, ed., with the assistance of Cynthia Roman. Horace Walpole's Strawberry Hill. New Have and London: The Lewis Walpole Library, Yale University, Yale Center for British Art and the Victoria and Albert Museum, in association with Yale University Press. ISBN 978-0-300-12574-0. Catalogue of the exhibition held at the The Yale Center for British Art, 2009 and the Victoria and Albert Museum, 2010, cat. 167, p.86. This object features in 'Out on Display: A selection of LGBTQ-related objects on display in the V&A', a booklet created by the V&A's LGBTQ Working Group. First developed and distributed to coincide with the 2014 Pride in London Parade, the guide was then expanded for the Queer and Now Friday Late that took place in February 2015. Victoria & Albert Museum: Fifty Masterpieces of Woodwork (London, 1955), no. 30. Davoli, Sylvia, Lost Treasures of Strawberry Hill. Masterpieces from Horace Walpole's Collection. London: Scala Arts & Heritage Publishers Ltd., 2018. ISBN: 978-1-785541-180-6, p.85.